CAMBRIDGE, Mass., April 10, 2019 — The Event Horizon Telescope (EHT) captured the first picture of a black hole by using its eight ground-based radio telescopes to produce an image of the center of a massive galaxy 55 million light-years away. The discovery comes two years after the EHT was switched on and after several years of preparation, validating Einstein’s theory of general relativity, which showed that when a massive star dies, it leaves behind a small, dense remnant core. If the core’s mass is more than about three times the mass of our sun, the force of gravity overwhelms all other forces and produces a black hole. The EHT, designed to capture images of a black hole, links radio telescopes around the globe to form an Earth-size virtual telescope with unprecedented sensitivity and resolution. 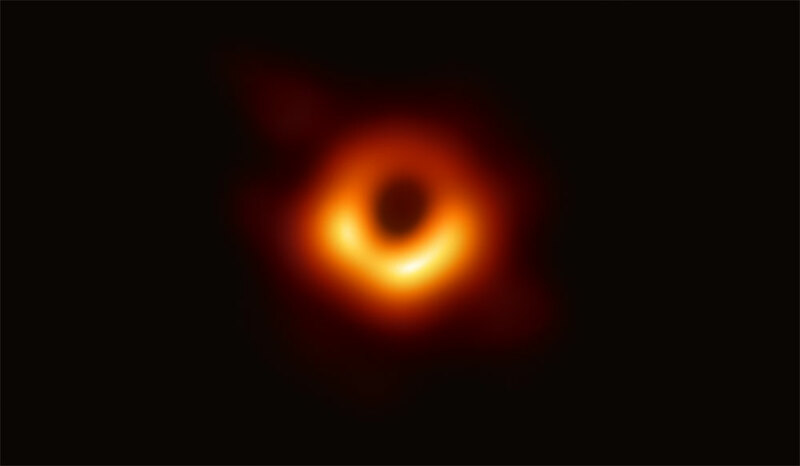 Scientists have obtained the first image of a black hole, using Event Horizon Telescope observations of the center of the galaxy M87. The image shows a bright ring formed as light bends in the intense gravity around the black hole that is 6.5 billion times more massive than our sun. This long-sought image provides the strongest evidence to date for the existence of supermassive black holes and opens a new window on the study of black holes, their event horizons, and gravity. Courtesy of Event Horizon Telescope Collaboration. The EHT system utilized very long baseline interferometry (VLBI) from the telescopes in eight locations: Arizona, Chile, East Asia, Germany, Hawaii, Mexico, the South Pole, and Spain. They are the ALMA, the PAEX, the IRAM 30-m telescope, the James Clerk Maxwell Telescope, the Large Millimeter Telescope Alfonso Serrano, the Submillimeter Array, the Submillimeter Telescope, and the South Pole Telescope. Staggering amounts of data — petabytes — were combined by supercomputers at the Max Planck Institute for Radio Astronomy and the MIT Haystack Observatory. Thirteen agencies partnered to make EHT work with funding provided by the U.S. National Science Foundation, the European Union’s European Research Council, and some funders in East Asia. Together, they created “one huge Earth-size telescope observing at a wavelength of 1.3 mm,” EHT officials said. The magnification power achieved an angular resolution of 20 micro-arcseconds — a threshold that would allow someone in Paris to read a newspaper in New York, according to the experts. The image reveals the black hole at the center of Messier 87, a massive galaxy in the nearby Virgo galaxy cluster, scientists said. The fuzzy yellow-orange ring image shows the “shadow” created by gravitational bending, and the capture of light. This breakthrough was announced April 10 in a series of six papers published in a special issue of The Astrophysical Journal Letters (https://iopscience.iop.org/journal/2041-8205).